A microphone converts sound waves to electric waves. It was created at the same time as the telephone but was invented by several different people working independently. These included Johann Phillip Reis, Alexander Graham Bell, Elisha Gray, Amos E. Dolbear, and Thomas Edison. Bell’s microphone consisted of a small magnet attached to a flat diaphragm that was very light and sensitive enough to vibrate when sound waves contacted it. The magnet’s vibrations created a current in a nearby coil of wire through the principle of electromagnetic induction. There were many variations of the microphone developed in the late 1870s and 1880s. All were intended to improve the quality of telephone conversations. One important innovation was Thomas Edison’s 1878 discovery that a chunk of carbon could be used as a microphone. If wires and a battery were connected to the carbon in a circuit, the carbon conducted the current with a certain amount of resistance. That resistance would change slightly when the tiny vibrations of sound waves hit its surface. The change was enough to create a signal that could be fed into telephone wires and sent to a telephone receiver. Other inventors discovered ways to “modulate” a flow of electricity in this way, using electromagnets, capacitors, or resistors. One famous example was the use of a very lightweight coil of fine wire, attached to a diaphragm, in which a signal was induced by a stationary magnet. This was the famous “moving coil” designed by German inventors Siemens and Halske in 1877. The moving coil is still used today. However, the microphone was almost always used in telephones before the 1920s. Even after the phonograph appeared, recordings were not made with microphones for many years. The next wave of innovation came after the development of voice radio broadcasting, which was launched in many countries between 1915 and 1920. One of the earliest experimenters to broadcast voice by radio was Reginald Fessenden. Fessenden invented a type of microphone that could withstand the extremely high currents necessary to broadcast the voice in those days. His microphone could withstand a continuous flow of 15 amperes, but had to be surrounded by pipes carrying cool water to keep it from overheating. Bell Laboratories, as part of its ongoing research into sound, improved many forms of the microphone and introduced some new varieties. Bell Labs engineers improved the condenser microphone 1916, which was used in early talkies. Their “double button” microphone in 1920 was a variation of the telephone microphone, but was used widely in early radio stations in the early 1920s. The dynamic microphone of 1931 and the cardoid microphone of 1938 were later used in sound recording as were two important forms of capacitor microphone invented at RCA: the ribbon microphone of 1931 and the velocity microphone of 1932. In Europe, the most famous microphones of the day were condenser microphones designed by German engineer Georg Neumann. When Germany was split into Eastern and Western nations in the 1940s, Neumann microphones continued to be made in East Germany, and when the two countries were united almost half a century later, it was discovered that these classic designs were still in production. Many engineers consider the 1950s to be the peak of microphone design. Working examples of these older models are still highly sought by recording engineers today. Most of the later improvements in microphones related to their size rather than their sound quality. One example was the electret microphone. An electret is like a magnet, expect that it retains a permanent static electric field rather than a permanent magnetic field. The electret was discovered by Mototaro Eguchi in 1919, but was not used for microphones until about the 1960s, when James West and Gerard Sessler of Bell Labs invented the foil electret microphone. 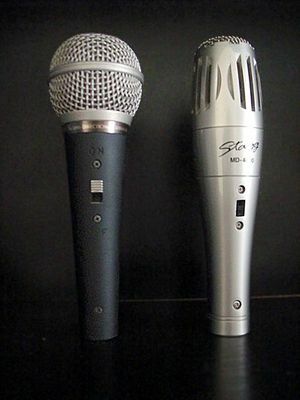 Since the 1970s, foil electrects have become the most widely used small microphones. Television, which became an international phenomenon after 1945, stimulated the demand for microphones small enough to be hidden on the body. 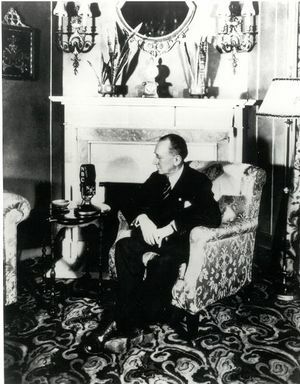 Back in 1936, the CBS radio network in the United States introduced microphones small enough to be clipped to ones lapel at the 1936 Democratic National Convention. Today, microphones are small enough to be hidden inside tape recorders and computers. This page was last edited on 17 September 2015, at 16:46.